Our next $10pp Sunset Cruise will depart from Noosa Marina 2 Parkyn Ct. Tewantin at 4:35pm on Thursday, Friday & Sunday. (Boarding from 4:00pm) Pay cash on board. Fully licensed (no byo) Follow the green footprints. Departs Early if Full. You can enquire about future dates below. The best deal on the river. Enjoy a relaxing lunch or dinner cruise along the beautiful Noosa River. Contrast the spectacular waterfront homes and vibrancy of Noosa Sound with the upper reaches of the Noosa river where whistling kites and other wild birds join us for a daily feed. Children under 12 half price. Kids under 4 are free. The Noosa Queen is available for private parties either catered or self-catered. Where better to enjoy that special occassion than in your own slice of paradise on the Noosa River? We have a licensed bar on board and can fit up to 65 passengers. 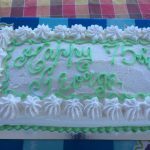 All parties can be individually tailored or you can check out some of our party options here. 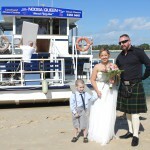 The Noosa Queen offers an imaginative and affordable alternative to fixed venues. Imagine celebrating your special day with friends and family while onboard the Noosa Queen, cruising the beautiful Noosa River enjoying the wonderful scenery along it’s shores. Choose to hold your reception or ceremony onboard or get dropped off on the beach for your ceremony. The choice is yours. The Noosa Queen is the only boat on the Noosa River whose top deck can be completely enclosed to keep your guests warm & dry during inclement weather. Passengers on the M.V. Noosa Queen cruise will enjoy a relaxing journey along the Noosa River. View the busy lower reaches including Millionaires Row along Noosa Sound and the contrasting serenity, wildlife and fauna of the upper reaches as far as Lake Cooroibah. Whether booking a Lunch or Dinner Cruise, a Private Noosa River Charter or taking advantage of our *$10 Sunset Cruise Special, know that we will go out of our way to ensure that you and your guests have a memorable Noosa River experience.